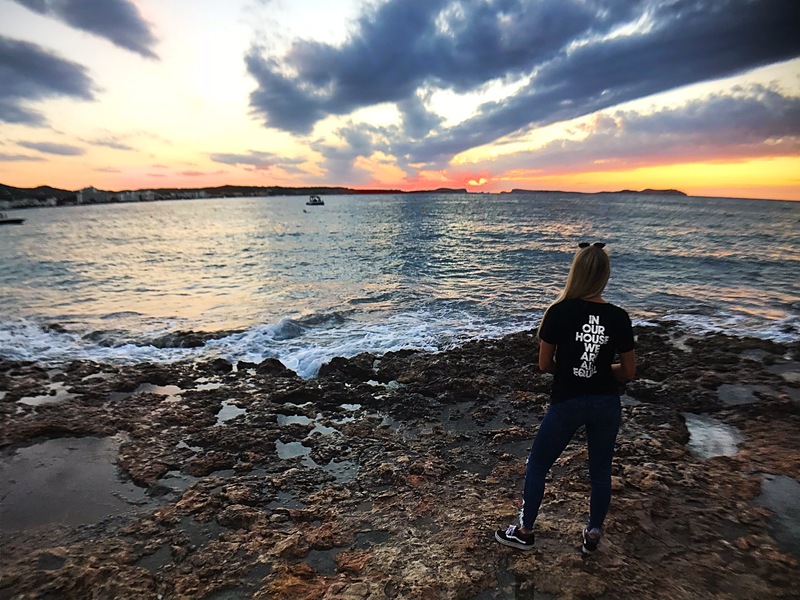 I was heading out on holiday with my friend Chelsea when I found out that I had been chosen as a finalist for the Defected Croatia 2018 Instagram contest. Chelsea and I have been working together for about 3 years and overtime I have been slowly converting her in to a House Head. As a country music girl, she’s new to the house scene but all summer she’s been learning a lot more about our world. As soon as I said “I’m going to Ibiza”, she called dibs on my plus one. I woke up to a DM saying that the contest had gone live, and to start voting! Most of my day at work was spent either getting my coworkers, friends, and family to vote for my picture, or checking the Defected Instagram story to see how my picture was doing against the others. Chelsea and I sent out blasts to everyone we know all over the world. The very next morning I woke up and immediately checked their Insta again to see who the winner was, but nothing was posted so I assumed I hadn’t won. After a few hours, I finally checked my email and had a message that I was chosen as the winner! For the next 4 weeks, Defected Ibiza was all Chelsea and I could focus on. Chelsea started listening to Defected Radio to get familiar with the music and the artists we were going to be seeing. As avid travelers, we were excited to be able to add in another trip to wrap up our year. We headed out on a Friday after work and boarded our flight to London, where we landed the next morning. We had a short layover which quickly turned into a 4 hour delay but gave us time for a quick “Disco Nap”. 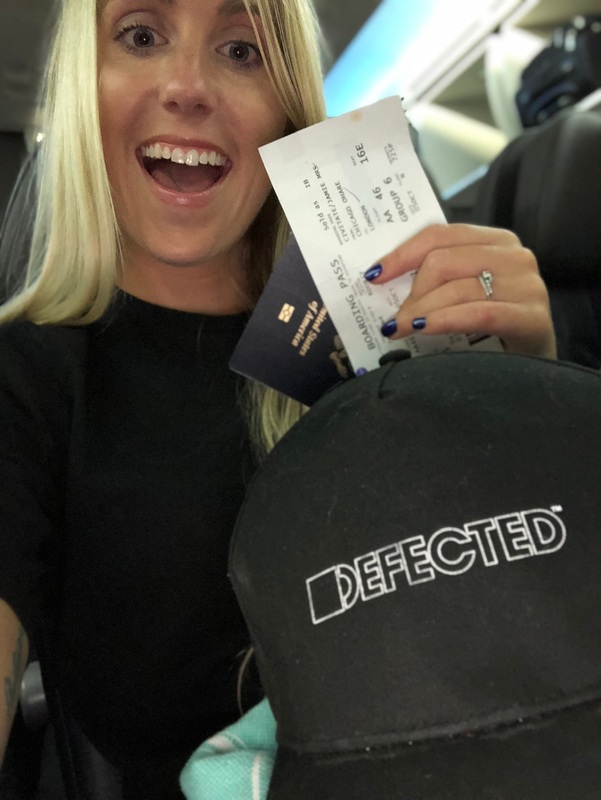 The Defected team continuously checked in on us during our travels and greeted us with a big hug and welcome at the airport in Ibiza. We finally arrived at our hotel which had an amazing view of the ocean. We quickly dropped off our bags and got ready to explore and experience Ibiza. We got a chance to check out a few clubs to start our trip off strong! Sunday we spent the afternoon by the pool taking in the view and catching some rays and resting up before the evening’s festivities. We arrived at Café Mambo Sunday night, where the view of the sunset was absolutely breath taking. We soaked up the view while sipping cocktails and having dinner with a few members of the team, along with Simon Dunmore and Sam Divine who were playing the pre-party that night. I can’t say it enough, but the community that Defected has is like none other, and Simon and Sam sure do know how to set the stage for what was an unforgettable night. We got a chance to meet a lot of people, hear how they work with Defected, and how they got involved in the house music world. It was amazing to hear how different everyone’s stories were and how they got connected to Defected. As Simon began to play, Sunset Strip started to fill in to start off a great closing night. They played a few of the hottest house bangers that I was excited to hear which brought me back to watching them in Defected Croatia. Walking in to an empty Eden was surreal to see. I’ve never been to a club before it opened and definitely never made it open to close. Getting the royal treatment from the team was amazing and I couldn’t be more thankful for everyone who set us up for an unforgettable evening. By far, Eden was our favorite venue of the weekend. The people, staff, and the vibe couldn’t be matched. Simon opened the club and set the tone for closing night. He paved the way for Defected Records and paved the way again to a strong finish to the season. People continuously filled the dance floor and before I knew it, the place was full! Mambo brothers were next, followed by Sam Divine. I loved watching Sam’s energy on the floor and how she was able to electrify the whole club. One of my favorite moments from the night was when Danny Howard dropped “Move out my way- Dennis Quin ft Shermanology” and Sam Divine and Jess Bays were there in VIP with us dancing and supporting him while he played. I honestly don’t think I could pick one favorite set from the night as they all surpassed my expectations and had the dance floor grooving. I was standing with Sam as she sang “you can’t stop this train” and by the third time it repeated, everyone around followed suit and were dancing in sync! Looking back now, I didn’t take a single picture or video myself while I was at Eden. I was so excited and zoned in to the music that I was living in the moment. I won’t forget when Chelsea looked at me and asked, “What have you done to me?! I LOVE this!” It was at that time, I knew I converted another one of my friends to house music and Defected! #housemusicalllifelong. Before I knew it, the lights were coming on and we were listening to the final track of the 2018 season. As the lights came up and ‘Lost’ by Amine Edge and Dance faded, I was reflecting on the season and this remarkable night. I couldn’t believe it was already over! As I left the club, I thought to myself, that was the quickest and most enjoyable night of my life. I couldn’t have wished for a better experience. With less than an hour until sunrise and our Monday unplanned, we popped a bottle of champagne when we got back to our hotel and watched the beautiful scenery from the balcony until we saw daylight. I couldn’t get the music out of my head and refused to go straight to bed. I didn’t want this night to end. We took it easy on Monday and hopped around to a few local spots in Playa del Bossa. We finished out our weekend at DC10 with Circoloco. We called it an early night Monday as we had to catch our flight back to Chicago the next morning. We had some VERY short transfers where we found ourselves running through the airports (yes- we were THOSE people). We landed in Chicago with a bittersweet feeling. We were happy to be home but already anxious for the next season. Walking off of the plane and through the airport, I looked over to see Chelsea doing the techno flip with her hands and dancing to the songs still in her head. 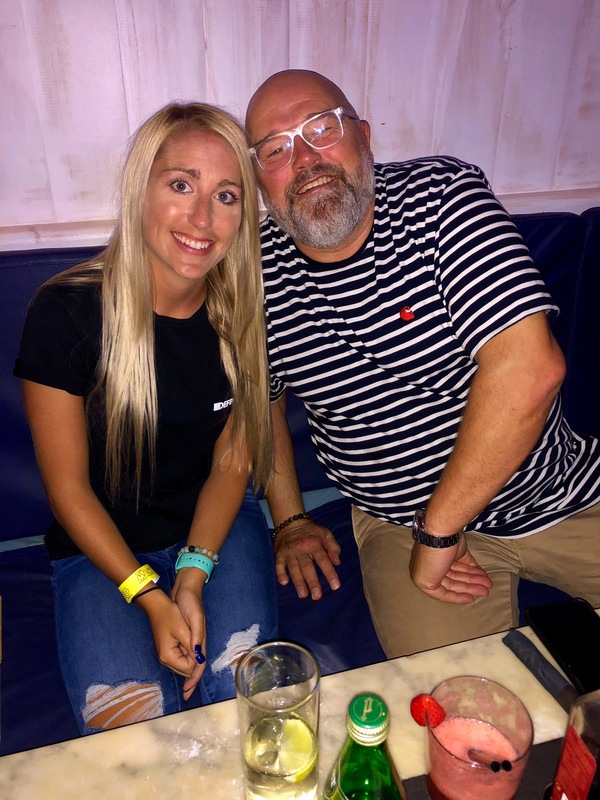 As we got on the train back in to downtown Chicago, the home of Frankie Knuckles, and the city of house music, me and Chelsea talked about the Defected USA tour which stops in Chicago in November. We can’t wait to party with Defected Records across the pond! I’ve been waiting for Defected to expand to the US and bring UK house to the states. Me and Chelsea can’t wait to party with you all again in Chicago. We are so grateful for the hospitality and we couldn’t ask for anything else.